Strong-Drive WSNTL Subfloor screws are ideal for fastening subfloor, sheathing, sill plate and stair tread applications using the Simpson Strong-Tie Quik Drive® auto-feed screw driving system. With lateral shear, withdrawal and pull-though values that exceed those of 10d common nails, the holding power of WSNTL screws reduces the gaps between the joist and subfloor that cause floor squeaks. Installing WSNTL screws removes the need for gluing in diaphragm applications, eliminating the precise timing, labor and materials that the process requires. Using screws that can be backed out easily allows future access to floor cavities. The WSNTL Subfloor screw may be used as 1-to-1 substitution for common nails in wood framed subfloor diaphragms per 2015 IBC and prescriptive subfloor sheathing applications per 2015 IRC. Minimum fastener penetration of 1 1/4" into the framing member is required. For wind design, shear capacities may be increased 40% per section 2306.3.2 of the 2006 IBC, 2306.2.1 of the 2009 IBC, and 2306.2 of the 2012 /2015 IBC. Allowable loads are shown at the wood load duration of CD=1.6. No further increases shall be permitted. For shear loads of normal or permanent load duration as defined by the NDS-2012, the values in the table above must be multiplied by 0.63 or 0.56, respectively. The minimum nominal width of framing members not located at boundaries or adjoining panel edges must be 2". Framing at adjoining panel edges must be 3" nominal or wider, and screws must be staggered where both of the following conditions are met: (1) screws having penetration into framing of more than 1 1/2" and (2) screws are spaced 3" o.c. or less. 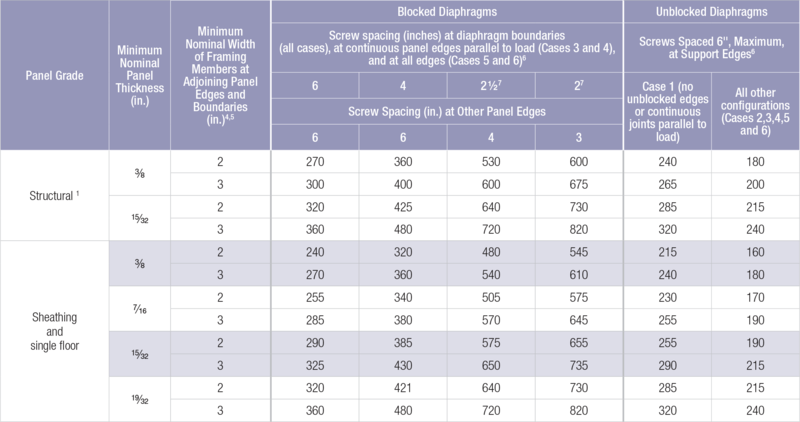 Space screws maximum 12" o.c. along intermediate framing members (6" o.c. where supports are spaced 48" o.c.). Framing at adjoining panel edges must be 3" nominal or wider, and screws must be staggered where screws are spaced 2" or 2 1/2" on center. See ICC-ES ESR-1472 for allowable shear loads for high load diaphragms. Use the lower of the pull-through or withdrawal values to determine axial design value. Screws must be installed straight into the side grain of the wood main member with the screw axis at a 90° angle to the wood fibers. The main framing member must be wood having a minimum specific gravity of 0.50 for DFL and SP main members, and 0.42 for SPF and HF main members. DFL is Douglas Fir-Larch. SP is Southern Pine. SPF is Spruce-Pine-Fir. HF is Hem-Fir. Table based on testing conducted in accordance with AC233. Design values presented are based on average ultimate values and divided by 5. Allowable loads are shown at the wood load duration factor of CD = 1.0. Loads may be increased for load duration up to CD = 1.6. The model number may end in the designation L or R, indicating that the screws are packaged as collated or for hand drive, respectively. Fastener penetration into the supporting member must be a minimum of 13/16". Table values are based on attachment of a 1 1/2" side member to a 1 1/2" main member of the same species and grade. Table values are based on the 2012 NDS, CD=1.0. Values shall be multiplied by all applicable factors, such as duration of load, etc. except where noted. Specific Gravities (G) assumed: DFL G = 0.50, SP G = 0.55, SPF G = 0.42. The spacing of applied uniform loads to the multi-ply member shall not exceed 24 inches on center. Assumes collated nail Fyb = 100 ksi. WSNTL212S and WSNTL3S withdrawal values based on testing per AC233. The model name may end in the designation L or R, indicating that the screws are packaged as collated or for hand drive, respectively. See additional Load Tables, Technical Data and Installation Instructions for the Strong-Drive® WSNTL Subfloor screw.